Observation - Marsh Marigold - UK and Ireland. Description: Clumps of yellow, buttercup-like flowers with large, shiny kidney-shaped leaves at the edge of a pond. 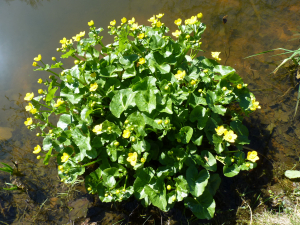 Clumps of yellow, buttercup-like flowers with large, shiny kidney-shaped leaves at the edge of a pond.